Beginning next year, government officials will have to declare their spending and the spending of their families. Officials will have to declare not only their own spending, but also the spending of their spouses and underage children. The source of funds for the acquisition of any property will need to be justified. Failing to do so will result in the official being fired and the property confiscated. The law also introduces criminal liability for failure to pay a fine that is envisaged as the main punishment for officials unable to prove the legality of their property acquisition. Penalties include house arrest or community service, with no jail time stipulated in this case. The new provisions will go into effect on January 1, 2013, and they will apply to transactions entered into in 2012. When filing tax returns in April 2013, officials will have to declare not only their 2012 income, as usual, but also their expenses during that period. 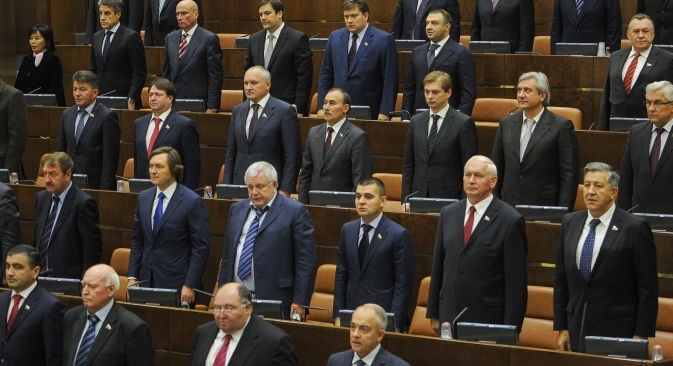 The new law will apply to parliament deputies, senators, government ministers and regional and municipal officials, as well as to Central Bank and Pension Fund employees. According to Vladimir Vasilyev, deputy Duma speaker and head of the United Russia faction in the Duma, the amendments will affect almost 10 million people. The government’s representative at federal courts, Mikhail Barshchevsky, estimates that, to control the spending of 10 million officials, the government will need to set up a special department with a staff of at least 300,000 people. “The number of officials falling under this law should be cut to at least 100,000; the law should apply only to ministers, governors, police chiefs, chief judges and prosecutors,” Barshchevsky told Ekho Moskvy radio. “If a governor and a vice-governor are not corrupt, they’ll make sure that department heads don’t embezzle money. They won’t allow their subordinates to be stealing and living richer lives than them,” the government representative said. Barshchevsky also noted that officials already declare their property, along with their incomes. “You can see what property an official has bought in the past year, if you compare their property and income reports for the past two years,” Barshchevsky said. The chairman of the Supreme Court of Arbitration of the Russian Federation, Anton Ivanov, believes that the spending controls system would be effective if officials spent money themselves. “It’s totally different, though, if it’s not the official, but his relatives or friends who will be spending all this money — to say nothing of the huge and largely unaccounted for cash turnover in our country,” Ivanov told Forbes.ru. Ivanov believes that, sooner or later, Russia will have to implement controls over spending by all of its citizens. “It will be practically impossible to hide money or property then. But, if we start charging officials with criminal offenses, while ordinary citizens are not held accountable for the same violations, we will be in breach of the constitutional principle of equality, which is unacceptable,” he said. The set of spending control bills was introduced to the State Duma by Dmitry Medvedev in March 2012. He had admitted earlier that the existing method of fighting corruption — publishing data about officials’ income — was not working. He stated that the first campaign of publicizing government officials’ incomes brought almost zero effect. This article is based on materials from the following sources: Lenta.ru, The Federation Council web portal, Vek online newspaper, Rossiyskaya Gazeta, the Federal News agency, Forbes magazine, Ekho Moskvy radio, and the RBC news portal. The story is based on materials from Lenta.ru, Rossiyskaya Gazeta, RBC Daily, Forbes.ru and the Echo of Moscow radio station.